Havering’s Mayor praised pupils from Hornchurch High School for their community spirit when they turned into local volunteers for the day. Students from year groups seven to 10 stepped out in the community in what they called a Drop Down Day, where students dropped their timetables for the day to focus on PHSE (personal, social, health and economic) and citizenship topics. Instead, pupils decided to litter pick, pack bags for a local charity at Tesco supermarket, plant bulbs and shrubs for LBH Hostels, tidy green spaces at Langton Gardens and Raphael’s Park and sort and clean items at a Rainbow Trust charity shop. The day was arranged by their school and Havering Volunteer Centre. More than 90 pupils signed up to get more involved in their local community and to take pride in their surroundings. 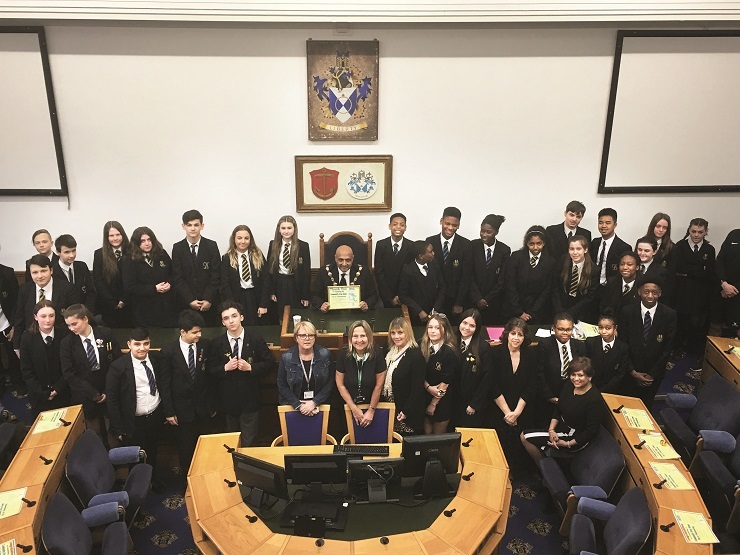 Their efforts were rewarded with a trip to Havering Town Hall where they met the Mayor Councillor Dilip Patel and were presented with certificates to acknowledge their efforts. “Young people are often getting bad publicity and blamed for anti-social behaviour. These students were a real credit and each and every one of them should feel proud of the achievements they made that day. We are proud to have been part of this “drop down day”. She added that one student was particularly upset that after he had picked up litter someone had dropped more.